How to restore a driver to its previous version in Windows 7? Please let me know how a driver can be restored to its previous version in Windows 7. Windows 7 hanging when clicked on "System Restore". Re: How to restore a driver to its previous version in Windows 7? It has to be taken note that you should be logged in as an administrator for performing these steps. That’s it. This is how you can roll back a driver to its previous version in Windows 7. Windows 7 is the latest version released by Microsoft Windows. And it is included many new function compared to the previous version. So you upgrade your system to Windows 7. While after upgrading your driver, you encounter problems with your computer or device. So you hope to restore the driver for a device to a previous version. Double click the category containing your device driver, and then double-click the name of the device that you want to restore to a previous driver version. If you are logged on as a standard user, the button will be dimmed, which means it's unavailable. You must be logged on as an administrator to roll back a driver. Done! Finishing all the steps above mentioned, you have restored your drivers in Windows 7 to previous version. Now you can update your system drivers again. This guide just offered you a way to restore a driver to its previous version in Windows 7. Attention please, it's best to check Windows Update for an updated driver, if you haven't already done so, before you restore a previous version. " follow these steps to restore a driver to its previous version in windows 7. Select the option System & Security. Choose Device manager from System option. Double click on the category which contains your device driver. Double click on the name of the device for which you want to restore to the previous driver version. Click on Roll Back Driver option. 3.Under System, then click Device Manager. 4.Double click the category containing your device driver. 5.Click the Driver tab, and then click Roll Back Driver.this step restore your drivers. 1.Open START>CONTROL PANEL>SYSTEM AND SECURITY and then under system then click DEVICE MANAGER. 2.Double-click the category containing your device driver. 3.And then double-click the name of the device that you want to restore to a previous version. 4.Click DRIVER tab,and then click ROLL BACK DRIVER. 5.If you are logged on as a standard user, the button will be dimmed, which means it's unavailable. 6.You must be logged on as an administrator to roll back a driver. Step 2: Double click the category containing your device driver, and then double-click the name of the device that you want to restore to a previous driver version. Step 3: Click the Driver tab, and then click Roll Back Driver. Warning: If you are logged on as a standard user, the button will be dimmed, which means it's unavailable. You must be logged on as an administrator to roll back a driver. 3. Click on the Device manager. 4. After that you will requires the Administration Permission to promote and the Confirmation and the Password will also required. 6. Click on the Roll back Driver. 7. After the Processing click on the apply of the save option and exit. 1. Clicking the Start button then click Control Panel, after go to “System and Security”, and then, under System, clicking Device Manager. 2. Double-click the category containing your device driver, and then double-click the name of the device that you want to restore to a previous driver version. 3)Double-click the category containing your device driver, and then double-click the name of the device you want to restore to a previous driver version. Click Start button on windows desktop. Go to Control Panel by selecting from menu pop up by clicking start button. Go to section System and Security of control panel . Click on system option from System and Security. 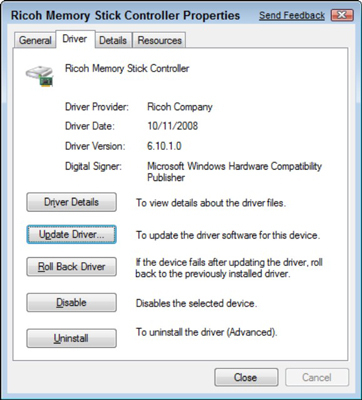 Select Device Manager from the options for rollback of drivers . Now double click on the category that contains your device driver. Under these category Driver check for rollback option. click on the Roll Back Driver and you are done . You can restore the its previous version through this way. 1. Disconnect the device that’s causing trouble. 2. Choose Start→Control Panel→Hardware and Sound and click the Device Manager link. 3. Click a device category to display the devices, and then right-click the device you want to roll back and choose Properties. 4. Click the Roll Back Driver button and follow the instructions. Now you can enjoy with its previous session.